When you are letting out a property, you will need to put a tenancy agreement in place that will protect your rights as a landlord and will also advise your tenants what rights they have. Do I Really Need a Tenancy Agreement? It's amazing how many landlords don't insist on a tenancy agreement when they let out a property - especially when you consider that around 50% of landlords will have tried to remove a tenant from their property due to noise, violence and anti-social behaviour, and more than half of these will have had to go to court to take the matter further when the tenant refuses to leave. Without a tenancy agreement it can be a costly and damaging experience. From the tenant's point of view, it should also offer the tenant peace of mind that they can have a peaceful and uneventful tenancy, as long as they can keep to the terms and conditions of their agreement. What Will the Tenancy Agreement Cover? It depends on the type of agreement you have. 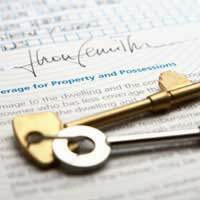 Before you start looking at the different options available you will need to check with your mortgage provider if there is a particular type of tenancy agreement that they want you to have. The most common type of policy, both these policy types apply to those tenants who are not living in the same property as the landlord and gives them rights over who comes and goes from their property. It also gives them protection against unfair rent – amongst other benefits. Since 1996 all tenancies that started since Feb 1997 automatically fall under the shorthold category unless the landlord takes steps to set it up as an assured tenancy. If you think you might just be letting out the property for a short while, you'd be better off going with a shorthold tenancy. The difference between a shorthold tenancy and an assured tenancy is that with the former you can ask the tenant to leave 6 months after the start of the tenancy as long as you give them 2 months notice. With the latter, your tenant has the right to stay in the house unless you can take the matter to court and prove that you have sufficient grounds to take possession of the property. certain types of repairs, such as the structure of the property, sanitary installations such as washbasins, baths, sinks and heating and hot water systems. keeping the gas appliances safe and tested every year by a registered CORGI tradesman. You have to keep a record of the checks and give a copy to the tenant within 28 days of the yearly check. Any gas appliances the tenant brought with them are their responsibility, not yours. Ensuring that anything you supply, such as electrical appliances or systems, heaters and boilers, is safe to use. Making sure any furnishings and fittings you provide fall into line with the fire resistance requirements, unless you are letting the property out for a short time, such as while you are away on holiday or on business. If unsure, you can check with your local council if the regulations apply to you. You MUST tell both your mortgage provider and your insurer that you are letting out the property – you may even need to switch mortgage types if you didn’t buy the property for renting purposes. Your mortgage provider may agree to the buy-to-let but insist that you take out full insurance on the property and agree to keep it active before you rent it out. Check with them first before you go any further. If your mortgage company are happy with the situation then you need to advise your home insurer. If you don’t tell your insurer that you are renting out the property and then a claim is made, they can refuse to pay out. The insurer also needs to know when the property is not occupied, so that they can increase the premium if they feel there is a higher risk of damage/burglary. Don't be tempted to lie or hide the fact that you're renting as if you are found out it is likely that any claims you make will be null and void and you'll lose the money you've already paid into the policy.